Boomerang, the Facebook-based gifting service that launched its beta test in Chicago earlier this year, just announced that it is now expanding beyond its initial market and making its first move toward launching its nationwide operations. Starting today, Boomerang users in three new cities, New York, Austin and Indianapolis, can now send each other real-world gifts like cupcakes, drinks, massages or kayaking adventures. Users receive these gifts through Facebook or email in the form of digital vouchers that they can then redeem at local businesses. To make it harder for people to forget to send gifts, Boomerang users Facebook data to highlight important events in the lives of its users’ friends (think birthdays, new jobs, new homes, etc.). Recently, Boomerang also added the option to personalize its virtual gift cards with themes, stamps and messages. Boomerang is also launching its iPhone and Android apps today, which should make redeeming these gifts quite a bit easier for the service’s users. 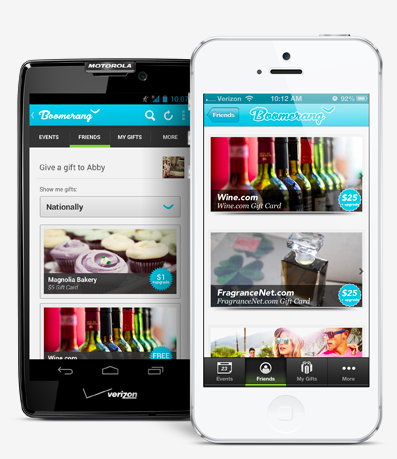 With today’s launch, Boomerang is adding a wide variety of new partners, including Wine.com and Travelocity, as well as major national brands like Barnes & Noble, Banana Republic and Gap. Boomerang is now also working with a number of charitable organizations like the Greater Chicago Food Depository and Mercy Corps to let gift givers make honorary donations in the recipients’ names. Smith notes that “there is nothing more effective and powerful than a friend’s referral to win new customers.” While Boomerang is obviously working with a number of major brands, the service also aims to create deeper relationships with small businesses as it continues to expand to new cities. This sounds a bit like Groupon, and there is probably a reason for that. Boomerang is backed by Lightbank, the investment fund created by Groupon’s founders. Earlier this year, the fund invested $1 million in the service after the team pivoted away from its original idea of building a travel recommendations site under the name Gtrot.